This box set includes all five books in the USA Today recommended Elementals series and is over 1,400 pages of magic, adventure, mythology, and romance. 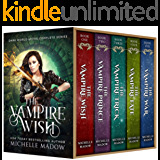 Nicole Cassidy is a witch descended from the Greek gods... but she doesn't know it until she moves to a new town and discovers a dangerous world of magic and monsters that she never knew existed. When the Olympian Comet shoots through the sky for the first time in three thousand years, Nicole and four others -- including mysterious bad-boy Blake -- are gifted with elemental powers. But the comet has another effect -- it opens the portal to another dimension that has imprisoned the Titans for centuries. After an ancient monster escapes, it's up to Nicole and the others to follow a cryptic prophecy in time to save the town... and possibly the world. Thousands of copies sold. Over ten MILLION pages read. 500+ five-star reviews for the series. 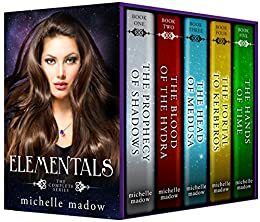 Now, for a limited time, save 50% compared to buying the individual books by reading the entire Elementals series in this special bundle deal! "Elementals is a compelling, pulse-pounding, fast-paced hit!" "This series is one that everyone should read. I've never read a better book!" "I didn't stop reading unless I had to work, sleep, eat, or if my tablet died!" "This series is fast paced and keeps you begging for more... it's a must read!" "The Elementals series is one of my favorite series of all time and I highly recommend it to everyone!" What are you waiting for? Scroll up and click buy now to find out why readers all over the world have fallen in love with the Elementals series! After completing this series I am amazed by Michelle's writing. I understand that it is a young adults series and I will be recommending to my daughter to read I think she will really enjoy this series. In this series we meet a group of high school students who are slightly different from the rest of the schools population. They are set on a journey to save the world they are descendants of the Greek Gods. Each book sees the kids on a different journey or task and strong friendships form. The series ends with only a few happy ever after, which is good as life isn't all about happily ever after for everyone. Honestly if I started to talk about this series I would give everything away about it. So just read the series. Received first book and was instantly hooked by the characters finishing the whole series within 10 days. Enjoyed the way Michelle incorporated the concept of Greek gods and strategic grecian historical ideas into this series. A fascinating and thoroughly enjoyable series. Nicole thinks she is a normal teenage girl until she moves to a new town and discovers that she is a witch descended from gods. Luckily, her powers emerge along with a small group of four others, who call themselves the Elementals. They soon discover a new magical world, that, unfortunately, also has a dangerous prison world of Kerberos that contains a lot of very dangerous monsters. The Elementals find an ancient prophecy to save the world and end up going on the ultimate scavenger hunt type of adventures. Each of the Elementals has a unique power and Nicole’s power to heal holds a much darker side that she hope she never has to use. As the veil to the portal to Kerberos begins to weaken, the Elementals rush to fulfill the ancient prophecy and save the world. Throughout the five books, they fight drugged up islanders, sea monsters, lotus-zombies, Medusa, Hydra and many, many other dangerous, yet interesting, monsters. They also have typical teenage battles between the group (Blake used to date Danielle, but is now interested in Nicole) while battling their typical young adult, roller-coaster emotions. As they get stronger as a group, learn to work together, get a little help from the Gods, they take on battles that no mortal could win, let alone survive. I devoured this series in one day (yes, all five books) as I was home sick in bed and needed something to make me feel better and all five books are an easy read. I could not get enough of this series. It has Greek mythology, lots of action, typical teenage angst, and a sweet romance as Nicole falls for bad-boy Blake, another Elemental. Kerberos is a fascinating, amazingly well described dark world. Even though the characters are messy teenagers with lots of young adult emotions, I truly cared about them, especially as a group, wanted them to succeed in their mission, and wanted to know what happened in the next book. Thankfully, Elementals 5: The Hands of Time, brings the series to an exciting, action-packed conclusion. Appropriate for young adults and up! I highly recommend this enjoyable series! 3.0 out of 5 starsThe story did come to an ending, but it wasn't closure. This is a series that started out interesting with interesting characters and then slowly descended into the muck of cliché plot and obvious betrayals that it seems many stories run into. I can't really go deep into detail on what struck me about this series without revealing spoilers, especially for books 3 and 4, which seemed to have the majority of the really obvious plot devices. The sad thing is that I really liked the characters at first and I thought the idea had a ton of potential, but the nature of the peril the characters were in, along with how narrowly Michelle worked on her character development and plot meant that there were multiple times where I just didn't care about any of the characters. The end is a nice play on several clichés, but it annoyed me far more than it impressed me. Overall, this is a series that started out as a strong 4 star in book one, but by book 4 was definitely struggling to hold onto 3 star status in my mind. It just couldn't seem to remain high quality as the story slowly devolved rather than developed. 3.0 out of 5 starsITS ONE MASSIVE BOOK not seperate. I haven't read the book yet, but just so people know this is not a box set of all the separate books. It is one MASSIVE book of all 5 books with very small font. I didn't realize this when I bought it but it isn't that big of a deal just a little surprising and a little inconvenient because it's very bulky I can't fit it in my purse to bring with me anywhere. 5.0 out of 5 starsCouldn't put them down! I loved this 5 book series. I read all five in less than a week. This story was the most engaging I've read in a while. I fell in love with the characters instantly. The plot twists kept the pages turning. I am seriously impressed with Michelle Meadow and her writing style. I highly recommend this book if you're interested in magick, Greek dieties, and we'll written characters. It had a lot of potential but in too many places it fell flat. The main character was given a copy of a three hundred year old scroll and told to solve the mystery by her magic teacher who then just walked off. There were a couple of places in the series where the "Heroes" were facing real trouble but the story had too many deus ex machina moments for the sake of convenience. There was a lot of potential but it just seemed wasted. Won't tell you not to buy as it was an interesting story.